We assessed the ecological risk of mercury (Hg) in aquatic systems by monitoring common loon (Gavia immer) population dynamics and blood Hg concentrations. We report temporal trends in blood Hg concentrations based on 334 samples collected from adults recaptured in subsequent years (resampled 2–9 times) and from 421 blood samples of chicks collected at lakes resampled 2–8 times 1992–2010. Temporal trends were identified with generalized additive mixed effects models and mixed effects models to account for the potential lack of independence among observations from the same loon or same lake. Trend analyses indicated that Hg concentrations in the blood of Wisconsin loons declined over the period 1992–2000, and increased during 2002–2010, but not to the level observed in the early 1990s. The best fitting linear mixed effects model included separate trends for the two time periods. 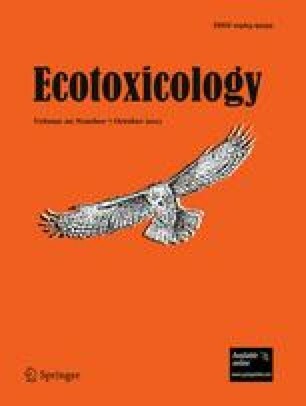 The estimated trend in Hg concentration among the adult loon population during 1992–2000 was −2.6% per year, and the estimated trend during 2002–2010 was +1.8% per year; chick blood Hg concentrations decreased −6.5% per year during 1992–2000, but increased 1.8% per year during 2002–2010. This bi-phasic pattern is similar to trends observed for concentrations of methylmercury and SO4 in lake water of an intensely studied seepage lake (Little Rock Lake, Vilas County) within our study area. A cause-effect relationship between these independent trends is hypothesized. The online version of this article (doi: 10.1007/s10646-011-0759-1) contains supplementary material, which is available to authorized users. Several dozen field staff endured the long nights of loon capture and sampling over the past 20 years to provide the data for this study. Dr. David Evers, Biodiversity Research Institute, conducted the initial sampling and trained WDNR staff in proper common loon capture and handling techniques. R. Arneson (WDNR) coordinated the project’s laboratory work at the Wisconsin State Laboratory of Hygiene where analytical services were provided by D. Kennedy-Parker and staff. Supervisory support for long-term Hg monitoring at WDNR was provided by G. Bartelt, D. Knauer, K. Martin, R. Dumke, and J. Sullivan, Bureau of Science Services. This project was supported through the WDNR with funds from the Federal Aid in Wildlife Restoration Project W-160-P, the Wisconsin Acid Deposition Research Council, the Wisconsin Utilities Association, the Electric Power Research Institute, USEPA Science To Achieve Results grant R82-905, the USGS Upper Midwest Environmental Science Center, and BioDiversity Research Institute. We thank C. Schrank (WDNR) and B. Gray (USGS UMESC) for reviewing an earlier draft of this manuscript.